Pearl Esther Lacox, daughter of Albert Eugene Lacox and Maple Forrest Mason, was born Aug. 14, 1906 in Adams Co., Iowa and died April 25, 1985 in Omaha, Douglas Co., Nebraska. 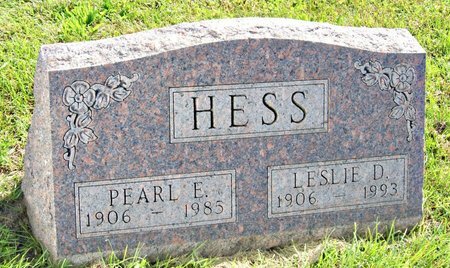 She married Leslie Duer Hess May 26, 1929 at Clarinda, Page Co., Iowa. He was born Nov. 3, 1906 in Taylor Co., Iowa, son of John Henry Hess and Ida Kate Duer, and died Mar. 1, 1993 in Villisca, Montgomery Co., Iowa. Searching for PEARL ESTHER HESS in Taylor County Iowa?